Shikoku is an island south of the Chugoku region, between the Kii Peninsula and Kyushu. Shikoku includes four prefectures, Ehime, Kagawa, Tokushima and Kochi. You may think Shikoku is temperate all year round, but that is not the case. The winter season in Shikoku is quite cold. This is due to a cold front that blows from the Kanmon Straits, Sea of Japan. Kochi prefecture has the coldest climate, often falling below 0℃. Many days the temperature falls below that seen in Shimane and Tottori prefectures that are located further north. 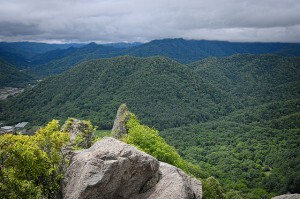 Shikoku is famous for the Shikoku Pilgrimage. The pilgrimage is a journey to visit the 88 temples associated with the Buddhist monk Kukai. The rule in going around to these sites is to wear costumes — a white shirt with a cane, while collecting cards from the 88 temples. Recently buses started routes between temples to make the pilgrimage easier. Others take a bicycle trailer in traditional style, but this has become a problem recently as it hinders traffic. The central city is Matsuyama, which is famous for Dogo Onsen and the novel Botchan by Soseki Natsume. Kagawa prefecture has the least name recognition out of the four prefectures in Shikoku. When people are asked to name the prefectures in Shikoku, people often forget this prefecture. But the locals have abundant energy perhaps due to its low recognition. In other words, because the prefecture is hardly noticed, the locals are free to act the way they like. Some people say there is nowhere more interesting than Kagawa. Kagawa also has a popular local dish : the Sanuki udon. Why don’t you try real Sanuki udon in Kagawa? It is different from other types of udon! There is a lot of reasonable gourmet in Tokushima. You can enjoy Tokushima ramen noodle, Take Chikuwa, breaded fish cutlet only in Tokushima. Mount Tsurugi is great for climbing and viewing autumn leaves. Kochi is famous for skipjack tuna (bonito). 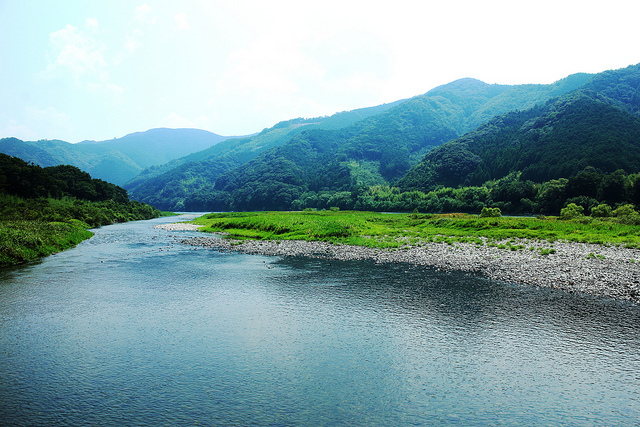 It is known for Shimanto River and Yosakoi festival as well. In Kochi, Japanese popular TV show Waratte Iitomo! starts at 3pm, which is usually broadcasted at 12pm in any other areas in Japan.